Bac kground Note: The proposal below was the result of an assignment given by E.L.A. teacher Ron Adams to his 7th grade students at the Broad Meadows Middle School (BMMS) in Quincy, MA in September 2013. For the assignment, students had to select two historic sites in Quincy they felt were important. 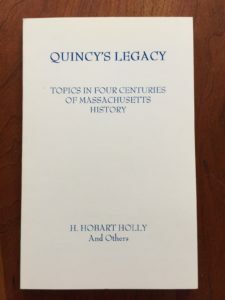 The assignment led one student, Michaela O’Gara-Pratt, to look at a copy of Quincy’s Legacy, a book produced by the Quincy Historical Society in 1998. Through that book, she learned of a Native American site located right behind her school. Despite the proximity of the site to BMMS, the BMMS community was unaware of the history in its own backyard. When the students learned of the site, they started to think more about local Native American history. Many of the street names in the surrounding neighborhoods were Native American – Chickatabot Road, Wompatuck Road, Algonquin Road, etc. These names came from the Native American tribe that lived here before the area was settled by Europeans – The Massachusett. Much older evidence of Quincy’s early inhabitants existed, too. A major archeological find had occurred in 1999, when during the construction of a new playground near BMMS, over 200 Native American artifacts were unearthed. According to archeologists, the artifacts found at Quincy’s Caddy Park were at least 3,500 years old. In Social Studies, the 7th grade students of Quincy were learning about ancient cultures in far-away places like Africa and Asia. These cultures existed around the same time those artifacts had been buried, but there was no mention of the ancient culture that existed locally. The students decided to take action. 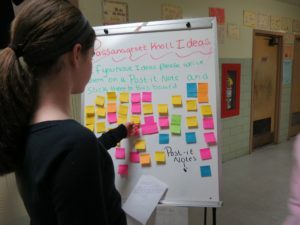 They submitted ideas on an “idea board,” and a dedicated group, dubbed the “History Girls,” formed. Return to the Commonwealth of Massachusetts from Colorado hundreds of First People artifacts unearthed in 1999 in Quincy at Caddy Park. 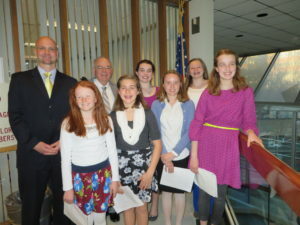 The School Committee gave their full support to the proposal. You can see the whole proposal here or read it below. Hello, my name is Michaela O’Gara-Pratt. I am a seventh grader at Broad Meadows Middle School. I am joined tonight by my classmates: Eve Anderson, Colleen Connor, Grace Higgins, Abigail Kraunelis and Mackenzie Maguire. I am here tonight to seek your support for our proposal to recognize Passanageset Knoll as a historically significant site. Passanageset Knoll is located in the Broad Meadows salt marsh. I am going to share with you my research on Passanageset Knoll, reasons why it should be recognized, and ideas for recognition, but before I do that I’d like to explain what led to this effort. Back in September, our class went on a field trip to the New Bedford Whaling Museum. Following the field trip, Mr. Adams, our E.L.A. teacher, asked us a question. “If students from New Bedford came to visit Quincy, which two historic sites would you want them to know about?” The challenge was that the two sites could not be Adams related because obviously the Adams sites would be stop number one on any field trip to Quincy. The assignment he gave us was to create two tourism posters of the two sites we chose. I chose to research the history of the Broad Meadows marsh area. Looking for inspiration for my assignment, I looked at a copy of Quincy’s Legacy, written in 1998 by H. Hobart Holly, the Director of the Quincy Historical Society at the time, and by several other local historians. It was in the first chapter of that book that I learned about Passanageset Knoll. 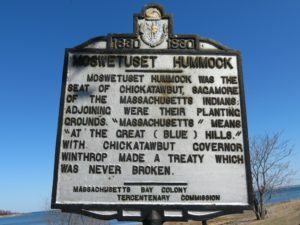 Chickatawbut died in 1633, and Wompatuck, his son and heir, did not have his seat at Moswetuset. Therefore, Moswetuset was the seat for only 13 years at most. We know so much about Moswetuset because Chickatawbut was there when this area was colonized in the mid 1620’s, and the settlers, including the famous Thomas Morton, documented it in writing. It is likely that for many more years, perhaps hundreds, one of the seats of the Sagamore of the Massachusetts Tribe was at Passanageset Knoll. Unfortunately, last century, Passanageset Knoll was excavated and removed for its gravel, but it was likely similar to Moswetuset. Like Moswetuset, it was elevated land surrounded by saltmarsh, which provided protection from wild animals, and it was close to the sea and planting grounds, both of which provided food. Even though Passanageset Knoll has been destroyed, the site remains protected thanks to the Broad Meadows Marsh Restoration project. We propose putting signage there. Native American history is an important part of Quincy’s history. It provides unique insight into early Native American life and the effects colonization had on it. It provides unique learning opportunities for residents, visitors, and students, especially the students at Broad Meadows Middle School. My research took an unexpected turn. During my research last Fall, I also learned that Quincy is also the site of the state’s best Native American archeological find in the last century (according to Ellen Berkland, DCR Archeologist), and we urge the city to celebrate this distinction. Over 200 Indigenous people’s artifacts, dating back about 3500 years, were discovered at Caddy Park in 1999 during the construction of a playground there. Those artifacts, interpreted perhaps as whaling artifacts, date back 3500 years, back to roughly the time of Ancient Egypt’s greatness. We study Ancient Egypt in grade 7. We propose the story of the people living here 3500 years ago be added to the grade 7 social studies curriculum. The Caddy Park artifacts currently are out of state, in Colorado, where they were being studied. It is time to bring them home to Quincy and display them or display replicas of them. Name the new park formed by the Broad Meadows Marsh Restoration Project “Passanageset Park”. Incorporate Passanageset Knoll into Quincy Public School curriculum on local Native American history. Place something on the site that will remind visitors of the site’s significance (e.g., a fishing weir, a mishoon or canoe, a lean-to or wigwam). Have events on the site that recognize the site’s significance (e.g., a weir-building event similar to the one DCR does when the Herring start to run or a historical walk). Create a website that provides information on Passanageset Knoll and local Native American history. We met with and have the support of these experts: Ed Fitzgerald, Director of the Quincy Historical Society; Gill Solomon, current Sac’hem of the Massachusett Tribe; Ellen Berkland, the State Archeologist of the MA Department of Conservation and Recreation; Superintendent of Schools Dr. DeCristofaro; and many others. 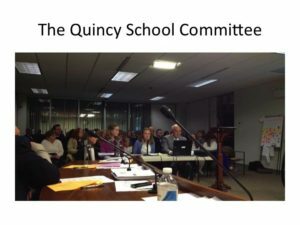 Tonight we hope to add to that list the Quincy School Committee as teammates and supporters of our proposals. Holly, H. Hobart and Others, Quincy’s Legacy, Quincy: Quincy Historical Society, 1998.